Stylists use a variety of cutting techniques to create the perfect cut for any particular hair type. Two techniques commonly used by professionals are texturizing and thinning. Each provides a unique look and solves style issues, such as bulkiness, bluntness and flat, lackluster hair. Texturizing and thinning create two very different and distinct looks. Hair that has been thinned will appear thinner, flatter and more controlled. Your stylist creates this look by thinning out sections of hair to remove bulk. Textured hair has a wispy appearance with shaggy, choppy or feathered layers and has more body than hair that has been blunt-cut with shears. The tools used for both techniques are identical, but the application will vary depending on the look you want. The most common tools used for texturizing and thinning are thinning shears, straight razors and the tips of standard haircutting shears. Other tools include razor combs and the cutting edge of haircutting shears. Whatever the tool used, your stylist likely will want to cut your hair dry versus wet. When the hair is dry, it's easier to assess how hair moves, its volume, and where any layers or thinning might be needed. Texture is applied to the ends of the hair. Texturizing techniques include softening the ends with a straight razor applied to the ends of the hair, nipping the very ends of the hair with thinning shears and point-cutting the ends of the hair using shears. Whether your hair is thick, flat, dull or chunky, there's a texturizing technique to help add body to your hair and achieve the look you desire. 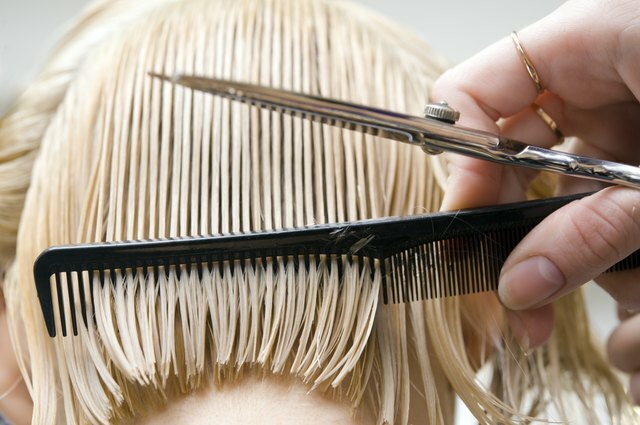 Thinning takes place at least 1 inch from the scalp and 2 inches before the ends of the hair. Thinning shears are used to eliminate bulk from the hair; straight razors are used to lightly soften and lighten the hair. With this technique, there is a special guard on one of the blades to ensure that only some of the hair is cut on a section of hair to achieve a thinned-out appearance. Depending on the type of hair you have and the style you want, your stylist may combine both texturizing and thinning techniques. Coarse, heavy hair may require a combination technique that involves texturizing and thinning. Combination techniques are performed by thinning and adding texture to the ends of the hair, as well as the midsection of the hair.